Beth Bee Books is my small book company/press. I design and assemble the books myself. The products available are listed below. 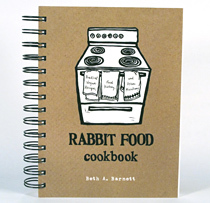 Beth Bee Books is on Etsy.com! Order your books with paypal or a credit card! How exciting! Published commercially by Sasquatch Books, Seattle. 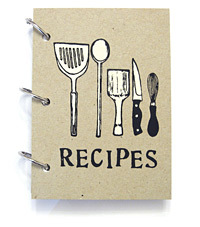 Blank recipe journal book with 8 tab dividers that are illustrated with block prints, continuing the cooking theme. 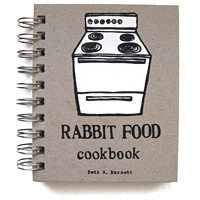 Use this book to keep track and organize your favorite recipes. This is more convenient than those pesky recipe boxes, and unlike most blank books, the pages can be arranged and rearranged, and even removed if you want. Now available with 4x6in pages, this book is also compatible with standard 4x6in recipe cards! This book contains 100 sheets of 24# partly recycled paper, Hand screenprinted Davey board covers (a recycled material), and 1" loose-leaf binder rings for binding so the book lays flat. Book rings can be easily upgraded to 1.5" or 2" size if you add more pages to your book. Dividers are die-cut ivory cardstock. size: 3.0" x 4.5" x 1" approx. These are unique and handy, especially for people with friends who are always changing their addresses. Think Rollodex on-the-go. 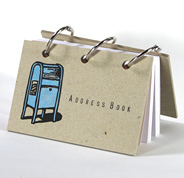 The address book holds business cards and your own artsy embellishments. There are 100 blank pages with 13 tab dividers, original block print artwork, and stamp lettering. There are several covers to choose from.